In projects and in life, we believe in treating others with respect and dignity. We take responsibility for our actions and our errors. We don't finger-point and we never make it personal. We don't believe that taking advantage is ethical under any circumstance. Read more about the concepts of managing with Aloha here. We used the Scaled Agile Framework's "Weighted Shorest Job First" technique as the starting point for establishing project backlog priorities. Rather than considering nothing but project ROI (which favors big, long-term projects), we take business value, time sensitivity, risk reduction, opportunity enablement, and estimated time to complete factors into account for each project in the search for projects that return the most for the time invested. This prioritization model allows the project team to optimize the economic benefit of all tasks in the project portfolio. These projects appear different but share many common characteristics, including complex pricing, high-volume invoicing, multiple EDI transaction types, cross-dock operations, and equipment control. The global name search routine is shared among all programs (some programs have additional search options). This program includes full-text search over customer names, street addresses, cities, states/provinces, and ZIP/postal codes to simplfy finding the right customer. Results are filtered: only bill-to's are shown when looking up bill-to's and only vendors are shown when in vendor maintenance. This conversion was more complex than usual due to need to convert a 3rd party, out-of-support, and undocumented rating system with six million lines of pricing data as part of a fixed-price implementation contract. Less than two months before cutover, the Company acquired a same-size competitor. 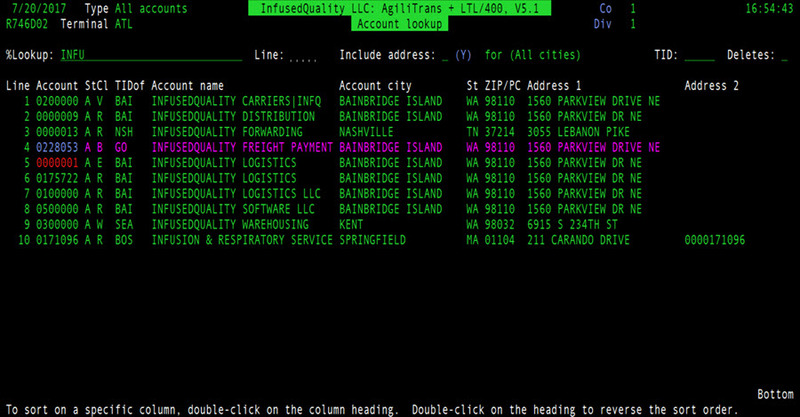 There was no practical way to load pricing into the mainframe so the acquisition's rating was converted into LTL/400. Rated bills were then uploaded to the mainframe. We developed new order new order entry, dispatch, warehouse management, wireless scanning, and EDI capabilities to support a very progressive domestic U.S. furniture carrier. After a few modifications to the rating system, we achieved a very high percentage of automatically-rated bills, which accelerated invoicing and collections. Over the years, multiple instances of LTL/400 have been deployed to support "private label" transportation services. LTL/400 was installed in the U.S. at a "white glove delivery" subsidiary of an international logistics firm. A substantial development contract was awarded to an offshore firm for a series of highly-customized feature additions. Reeve Fritchman traveled overseas to coach the programming team for several weeks and provided late-night support via conference calls for several months afterward. To support a Canadian customer without any in-house programmers moving from a low-function, hard-to-modify system to LTL/400 while merging three acquisitions with several unusual business requirements, we reconfigured several applications and modified several applications to protect the brand identity of the acquired companies.